the name of our beachfront resort in the Dominican Republic. Our acreage has a large tropical garden - condominium building with 4 condos - gorgeous large pool (essential tool for cooling off in summer!) round thatched roof bar, and the existing house, that we renovated into an open-air retail space/common area. 100 meters from the sandy beach, which stretches for miles in both directions, we can see the distant mountains behind our lagoon, while listening to the rolling surf. Natural fields border both our side walls, nestling us in in a sea of tropical green. At times, cows are pastured in the field on the west side. Their "moo-ing" takes us back to memories of growing up on a farm in Canada. With only one main road running along the north shore, our front street connects us the to the "whole world" as they pass by. A dozen local Dominican homes line up along the back lane behind our back wall. They're great neighbours who "have our back", and are happy to help in any way. When we bought our property in 2004, the backyard was a jungle. Lush tropical vegetation crowded over the sidewalk behind the house. Mother hens lead their broods of chicks, scratching and criss-crossing the yard in their never-ending hunt for bugs. Really fun to watch. Roosters crow at all hours,(definitely not following the "dawn-wake-up-call" rule!) a sound you need to make peace with, if you want a good night's sleep. Their numbers seem to take a dramatic downturn at times like Easter, and other holidays. Looking at it now, it's hard to remember how the backyard looked before, and all the work involved in building what's here now. 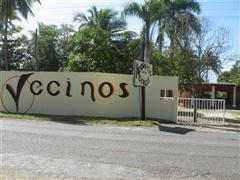 Let me show you around our DR beachfront resort home, "Vecinos". You can reach us via email, to communicate directly.